At 6 o’clock on Monday morning, the starting pistol fired and one-third of the field of ninety runners started off to tackle this 216-kilometre race which would finish halfway up Mount Whitney, the highest mountain in the Sierra Nevadas. I was one of the competitors in this first of three waves, and I was pretty happy to be on the early start; we could make some distance before the real heat kicked in! As it was, it was already 35 degrees, and the sun was nowhere to be seen. What was to come? Badwater, at close to 300 feet below sea level, is the lowest point in Death Valley (and the Western Hemisphere). And one of the hottest , as we were to find out more about that later on that day! 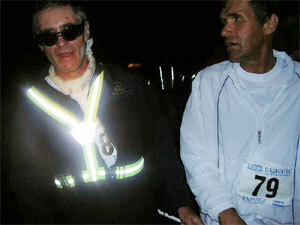 Flip Jurgens, my fellow South African, had committed himself to be my sighted guide/horse for the race and we were hoping to finish the distance within the 48-hour cut-off, thus qualifying for the coveted “buckle.” A sub-60 hour time was needed to be classified as an official finisher. As we trotted along the first 27-kilometre leg to Furnace Creek, the first check point, we were very conscious of what we were trying to do—all very well to plan a sub-48 hour attempt in the comfort of our own homes in South Africa, but no one had warned us about how horrifically high the mountain passes were and the baking heat had really worried me from the minute we stepped down from the jet at Las Vegas! Having read a fair number of the “blood and guts” articles from past races & having had much warning about Death Valley from the leathery veterans whom we met at race registration, we had decided to take the first 65 kilometres through the Mojave Desert very slowly. (As we saw later from the results, we were the last to leave the valley). 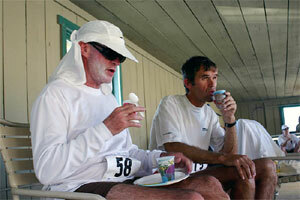 Come mid-morning, Furnace Creek was 40 degrees! A change into our lovely Patagonia tops and trousers was necessary, ice packs under our caps, bandanas and we were off. Just short of a standard marathon to go with supper awaiting us in the swimming pool at Stovepipe Wells: a fantasy which kept us slogging along through the ever-increasing heat of the day. The asphalt road started to stick to our shoes, and our feet felt as though they were being slowly roasted! Our wonderful crew were there for us every two and a half kilometres—smiling faces at every stop—swapping our water bottles, offering us Gu, freshly cut fruit, ice, food, and (most importantly) our salt tablets. We probably took three every two hours in that first day. I, in mentioning crew, cannot without writing a separate book about it, adequately describe their role in our race. Flip and I were blessed with a wonderful group of people, headed up by Bob Sitler, himself a veteran buckle holder of this event. We passed through a very stark, you could even say ugly, area in the mid-afternoon called the Devil’s Cornfield. The heat topped 50 degrees for our three hours through that arid section, and then Stovepipe Wells came into view. Flip wasn’t sure that he wasn’t looking at a mirage – we had both become pretty quiet during those last three hours. I seem to remember that we occasionally muttered to each other, “dit wort warm” … an attempt at some dry humour? Though we tried to walk along the white line, our feet just cooked; even my trusty Montrails started to sweat! When we finally turned off into Stovepipe Wells, with Death Valley behind us, our fantasies came true! We were very hot and tired, with my worst memory being of feet too hot to walk on any longer. Off with our clothes and shoes and into the pool—what a great feeling! We had taken 12 hours to do 65 kilometres and we were still within our time window. We had planned to spend only 45 minutes at Stovepipe, but our feet needed some attention and it was still incredibly hot: still well over 40 degrees at sundown, so we decided to wait a while, eat a good meal and then tackle Townes Pass at a respectable hour and temperature! We didn’t care that we were far back in the field at that time. We were still strong and another 150 kilometres of mountain passes and desert valleys still awaited us. We heard that some runners had already dropped out due to the heat, and we were still in reasonable condition. Bob and Patrick were to have a rest and be back with us at 1:00 a.m.—hopefully as we topped Townes Pass with Susanne and Daniel taking us for the climb out of Death Valley. Townes pass was an experience of its own: 27 kilometres of mountain which took us from sea level to over 5000 feet. The hot wind from the desert was still with us for a while, but the temperature gradually dropped and we reached the top in just under six hours. This section was still and dark with but few vehicles at that time of night. Flip kept a good lookout with his headlamp—there is a snake called the sidewinder which comes out onto the road at night! We were still on schedule with a couple of hours in the bank for a buckle, even with a planned 20-minute sleep in Patrick’s Sprinter van when we reached the lay-by at the top! All would have been great if he had been there! He and Bob went barrelling past the lay-by; they thought it was still another couple of kilometres. We sat for a while in another runner’s support vehicle, realising slowly but surely that our dream of a 20-minute sleep was history. Never mind all the other goodies: Coke, sweets, rubdown, etc!!! When our two apologetic crew finally arrived, we had lost 50 minutes and we only wanted to get going. We had another, even higher, mountain, Father Crowley’s, waiting for us at the foot of the next valley and we wished to tackle this one during the cool of early morning. Our next check-point was Panamint Springs, at the foot of Father Crowley’s, and I was hoping to make up some of the time we had lost to give me an opportunity to have some running repairs to my feet when we reached the check-point. I thought that we mike be able to make up the 30 minutes we lost earlier on by running down the 3000 foot descent into Panamint Springs. I hoped in vain. Flip and I agreed that it was far too steep, taking our quads into account, to run for the next 15 kilos. The best we could do was the last ten. We had now covered 120 kilometres in 24 hours: only 96 to go. Bob ran with us into Panamint Springs to discuss our feelings about buckling. If it wasn’t on, we, including the crew, could ease off a bit. If we were, we would have to watch our stops and now consider taking all our refreshments on the move—no more sitting down for a drink! We crossed that Rubicon in a fraction of a second, both simultaneously saying “yes!” The game was on! However, I had some thinking to do. I had been holding on for a break to sort out my feet at Panamint, but we had lost the time up Townes Pass when our crew went AWOL. Father Crowley’s—a 25-kilometre climb up to 6000 feet—was patiently waiting to test us, and the sun was remorsefully turning up the heat! I decided to postpone my pedicure until much later in the day: a good decision as things turned out. I don’t know why, but we were in a really crazy mood going up Father Crowley’s. We had taken the bit between our teeth to go for our buckles, were feeling great and we pushed it up the mountain as though we only had 20 kilos to go to the finish! While we suspected that we would pay for it later, it didn’t kill our mood—maybe we had mountain sickness! Father Crowley’s came and went during the morning and we were finally able to look down into the last valley: 55 kilometres of long, rolling downhills to another stark salt plain, passing through the tiny village of Lone Pine and then only 20 kilometres after that up Mount Whitney. Flip could see its snow covered peak in the distance: a 14,000 foot beckoning finger high in the sky with our own road winding away into the hot, dusty plain below! While it was good to know that we had done two-thirds of the whole race, and had put two hard climbs behind us, there was still a long, long way to go; and our slog up Father Crowley’s had taken its toll of our legs! While I am not saying that the next five or six hours passed in a blur, we both went very quiet and had to really focus on keeping going. Although we were now at some 6000 feet, the midday sun was baking. Luckily for us, not as bad as the day before. I seem to have memories of our crew yelling madly whenever we went by; particularly Liza from New York. The US Air Force was doing “beat-ups” almost overhead, and, magically, we seemed to be passing other runners! When I say runners, we all were trudging along, some limping, some chatting, but all taking strain. I had heard that this part of the race takes its toll of competitors: the “melt-down” rate of both runners and crew is high along this stretch, and I could fully understand why! I was sad to hear that my brother Miles had decided to give up at around halfway. He had trashed his feet and had been pretty drained by the Death Valley section. He, and his crew were now part of our support group during this section. I myself was now going through a pretty bad patch. My feet, which I had been able to put in the back of my mind for many hours, were now giving me stick. My legs were weakening. Basically, we were just tired! Stop time for Geoff and Flip: do feet, sit down for half an hour and get the body and mind right for the final slog. Only some 40 kilometres to go! We had a very welcome rest, my blisters were sliced, cleaned with what felt like boiling battery acid, and plastered—a few minutes of hell which I prefer not to recall! However, that break was magic. We were different men when we got to our feet. Could I have been walking on air and no longer on my blisters? Sundown was approaching and we got our second wind. Apart from the raw feeling in my mouth and throat, caused by breathing in all that hot air for all those hours, which made eating painful, I felt pretty good, and we didn’t doubt that we were going to make it! Neither did our crew. There was such a party mood, and all the fatigue of the past 40 hours dropped away! The lights of Lone Pine were in sight for a long while before we arrived, but that only seemed to raise our spirits, not weigh us down. We knew that once we were through Lone Pine, altitude some 3000 feet, there were only 20 kilometres to go! It didn’t seem to matter that we had to climb up to 8500 feet to reach the finish; it was just a monster Polly Shorts—one last vasbyt! Our time window for Lone Pine was between midnight and 1:00 a.m. We were pleasantly surprised to pass through just before 11:00 p.m. Seven hours to do only 20 kilometres—it certainly did not seem that we would be stressed by the clock—only by that huge mountain! I did not think that we would flag now that were on the very last leg. I was in for a nasty surprise when the hill proper started! I seemed to have no power at all in my legs, although I didn’t feel very tired, just had jelly for quads. On reflection, I realise that, because of my sore mouth, I had not eaten enough during the past eight hours and was much out of fuel. A rehydration drink did not tip the scales in my favour, and I started vomiting until I had absolutely nothing left! I felt pretty stressed; still 15 kilometres to go. The steep part of the mountain was waiting and I only felt like crawling! Flip was so strong, I think that he could have run up that last section. He was also a race entrant, and had the same expectations of a buckle! At eight to go, I had to call a halt. It was not going well for me at all. Nothing would stay down, not even water, and I didn’t have any idea at all how I would get up those last switchbacks which were looming over us. I felt so drained that all I wanted to do was sit down, better still, lie down. The exuberance of four hours ago was completely gone. We were now just six very quiet people all wondering how to help me put my race back together! There were very few other runners around. The field had really split up, and all I could hear was the wind through the huge Ponderosa pines and the river making its way down the mountain. We were already at the snowline. The smell of the pine trees was sweet and clean. Did we really spend all that time yesterday traversing a place like Death Valley? Yes, it was so good just sitting on that chair, letting what was left of my mind wander around any and everything but tackling that last eight kilometres. Just another time trial, we used to say in those far away days. Time to pull myself together. I realised that the stark reality was that it was just between me, the mountain, and the clock. Either I would make it to the top in time to buckle or I wouldn’t. If I fell apart completely, maybe I wouldn’t make it at all! But I had come too far, dreamed and trained too long to let that happen. Decision time. Flip had to leave me and go on – he was still strong and could cruise his buckle – no more time left to wait for me to recover. All agreed: Flip went off with Bob and Susanne in one of the vans while Henri, Dan and Patrick stayed with me. Well, without going into too much of a story, we just went very slowly up that last bit. The two-and-a-half hours I took must be my personal worst for eight kilometres! But, hooray, we got the buckle! The clock stood at 46-and-a-half hours when we slowly crossed that finish line at 4.30 in the morning—too tired for even the tears which the moment deserved. Flip was 35 minutes ahead, finishing in 39th position and I made 41st —exactly halfway down—or halfway up—the field of the 81 crazy people who tackled this year’s race. Thanks to our wonderful crew, who had come from Virginia, New York, Albuquerque and Standerton, and who had been with us for every step of the way, we had fulfilled the dream which had started around a little campfire during the 2004 Kalahari Augrabies Extreme! What’s it all about, Alfie? That has to be the most frequently asked question. Why do we do events like this? On one side of the coin, taking on a 200-plus-kilometre ultra is already a huge challenge. 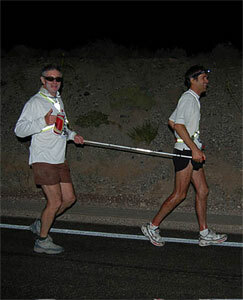 Adding in the heat of Death Valley to total climbing of over 13,000 feet makes the Badwater race a real monster! However, when you flip the coin it has to be seen as one of the greatest races in the world! It is impossible to describe the stark beauty and call of that desert with snow covered mountains looking down at you while you are struggling along in that heat. But, far beyond the pain caused by the temperature, distance, desperate fatigue and multiple loss of toenails, is the comradeship and joy of being part of such an event in a part of the world one would not ordinarily visit. There is a magic to the place which seems to draw runners back time and time again. A 70-year-old school caretaker from Britain notched up his twelfth this year, and there is undoubtedly a large and very friendly Badwater family who enjoy participating in this very well-organised race. If you are a South African long distance runner who has become a little restless and looking for new horizons, I challenge you to look at www.badwater.com – maybe we will meet at the 2006 race? 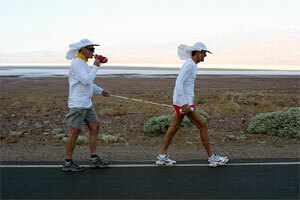 Photos by Chris Kostman and Badwater race staff.